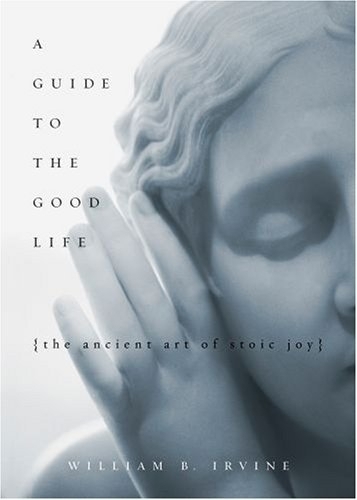 To begin with, I knew that the dictionary defines a stoic as “one who is seemingly indifferent to or unaffected by joy, grief, pleasure, or pain.” I therefore expected that the uppercase-S Stoics would be lowercase-s stoical — that they would be emotionally repressed individuals. I discovered, though, that the goal of the Stoics was not to banish emotion from life but to banish* negative emotions. I’d clarify that it’s not so much about “banishing” negative emotions so much as being curious and accepting of them — seeing them as neutral, not negative — rather than repressing them. It’s not about avoiding pain but about living in a way that attracts and creates joy. We normally characterise an optimist as someone who sees his glass as being half full rather than half empty. For a Stoic, though, this degree of optimism would only be a starting point. After expressing his appreciation that his glass is half full rather than being completely empty, he will go on the express his delight in even having a glass: it could, after all, have been broken or stolen. And if he is atop his Stoic game, he might even go on to comment about what an astonishing thing glass vessels are: they are cheap and fairly durable, impact no taste to what we put in them, and — miracle of miracles! — allow us to see what they contain. This might sound a bit silly, but to a someone who has not lost his capacity for joy, the world is a wonderful place. To such a person, glasses are amazing; to everyone else, a glass is just a glass, and it is half empty to boot. From a point of “maturity,” I’d judge this description as silly. But to someone who is lighthearted and embracing of their inner child, this kind of optimism is natural and beautiful. This quote reminds me that the number of things we take for granted increases each day… that the number of things we have and can appreciate accrues over time! I’ll appreciate them now. It’s true and unfortunate that it takes occasional and, sometimes, devastating losses to jolt us into choosing happiness. …There are people who seem to proud of their inability to take delight in the world around them. They have somehow gotten the idea that by refusing to take delight in the world, they are demonstrating their emotional maturity: to take delight in things, they think, is childish. Or maybe they have decided that it is fashionable to refuse to take delight in the world, the way it is fashionable to refuse to wear white after Labor Day, and they feel compelled to obey the dictates of fashion. To refuse to take delight in the world, in other words, is evidence of sophistication. I would argue, though, that what is really foolish is to spend your life in a state of self-induced dissatisfaction when satisfaction lies within your grasp, if only you will change your mental outlook. To be able to be satisfied with little is not a failing, it is a blessing — if, at any rate, what you seek is satisfaction. And if you seek something other than satisfaction, I would inquire (with astonishment) into what it is that you find more desirable than satisfaction. What, I would ask, could possibly be worth sacrificing satisfaction in order to obtain? The goal of Stocism is to live with tranquility — this is in contrast to other potential goals such as maximising pleasure, fame, money, status. Stoics encourage others to take joy in the small things and in what cannot be taken away, such as our character. One of the key psychological exercises/strategies the Stoics recommended for living a joyful, tranquil life, was “negative visualisation. [The Stoics] recommended that we spend time imagining that we have lost the things we value—that our wife has left us, our car was stolen, or we lost our job. Doing this, the Stoics thought, will make us value our wife, our car, and our job more than we otherwise would. This technique—let us refer to it as negative visualization—was employed by the Stoics at least as far back as Chrysippus. The strategy of contemplating death comes up in Buddhism and other life philosophies as well. I’m always reluctant to try this myself, but I do practice negative visualisation in moments of confusion and boredom — I find that it works for me, bringing me back to the small things that make me happy! I feel joy that I can exist, read, taste, move, and listen. Stoics believed in special breed fatalism — that things are “fated to be”… but only past things. They believed that we have free choice and control over our present and future, but that things that happened in the past were meant to have happened that way, thus there is no reason to worry about them. In general, they aim let go of anything that they did not have direct control over. Social fatalism: In our dealings with others, we should operate on the assumption that they are fated to behave in a certain way. It is therefore pointless to wish they could be less annoying. In the realm of emotions, Stoics encouraged practitioners to not dwell on negative emotions, see where those emotions were coming from (what beliefs, values, expectations), and rationally change what can be changed. They did not encourage repression, but believed that when grief, anger, or sadness lasts for a longer period of time, the feeler is probably thinking thoughts that fuel those negative emotions — and those thoughts can (and should) be changed. For one thing, life is too short to spend it in a state of anger. Furthermore, a person who is constantly angry will be a torment to those around her. More generally, why experience anti-joy when you have it in your power to experience joy? Why, indeed? I liked the emphasis on “practicing” Stoicism — it (like any other philosophy or habit) does not work immediately, even if we like the theory, and support the cause. It takes a commitment to tiny habits, and an awareness of where one is making progress or desiring improvement. Practicing Stoicism, he adds, is like training for the Olympics but with one important difference: Whereas the Olympic contests for which we might train will be held at some future date, the contest that is our life has already begun. Consequently, we do not have the luxury of postponing our training; we must start it this very day.